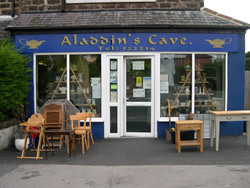 Welcome to Aladdin's Cave Established in 1993. We specialise in house clearance, flats, garages, full and part homes in Harrogate, Ripon, Wetherby and surrounding villages. Whether it's bereavement, down sizing, moving or emigrating, all your requirements can be catered for. We do work for local estate agents, solicitors and landlords when required. We are registered with the environmental agency and are fully licensed to carry waste. We recycle as much as we can. With your consent Suitable bric a brac and clothing is taken to charity shops. We have a shop in which we select and sell what we can. Unsuitable items will be taken to our local recycling centre. Give us a call and we will arrange to visit the property at your convenience to assess the items to be cleared. There is no charge for this service. We will then get back to you by telephone. Every clearance is different, so it could be that we pay you, you pay us or we may offer to clear free of charge*. Payment is due on completion of the job. *Tipping and labour charges are taken into consideration on all quotations and these costs can be offset against items of value removed during a clearance. Copyright © 2019 Aladdin's Cave. All Rights Reserved.